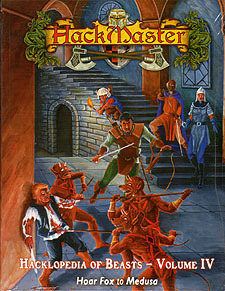 This comprehensive set of reference manuals is a must for HackMaster GMs. In this volume, terrifying monsters whose names begin with the letters Ho-Med are described in sometimes-frightening scientific detail. Every monster in the Fourth Edition Hacklopedia has been revised, edited, and updated and they have had their HackFactors beefed up to bring them in line with the rest of the game. Among other features, readers will learn about monster social structures, activity cycles, diets, attack modes (including special attacks), morale and even how to make the most of their kills by salvaging potentially valuable monster remains.